OXFORD, Miss. – Capping off nearly a year of discussions with people who have diabetes and diabetes stakeholders across the state, researchers from the University of Mississippi School of Pharmacy invited them all to a meeting in Oxford to generate diabetes research questions as part of a research initiative. 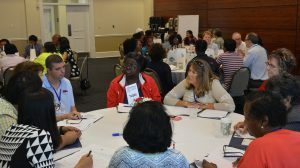 Researchers involved in the project, called “PaRTICIpate in Diabetes Self-Management Research Collaborative: A Conference Series,” invited people with diabetes to a series of meetings throughout northern Mississippi to ask how they manage their symptoms and to help them manage their condition. All participants were invited to the culminating meeting in late June. “The synergy of having people from all these different communities talking to one another meant that they came up with totally new and novel ideas for diabetes care,” said Meagen Rosenthal, assistant professor in the Department of Pharmacy Administration and co-lead investigator for the project. The patients’ discussions also underscored ways in which different communities approach diabetes prevention and management. When a participant discovered that some health resources in her community were not available in another, she and others began brainstorming ways to share the resources. At the end of the meeting, the researchers and graduate students assisting them had more than enough data and suggestions to begin narrowing down their list of research questions. Once the questions are finalized, the researchers will present their information to clinicians and stakeholders in several Mississippi communities in hopes of partnering to leverage the research into something greater. They also will ask patients to weigh in on which questions they are most eager to see answered. “We want the patients to be involved, start to finish, as much as they want to be,” Rosenthal said. As part of the researchers’ objective to ensure patients benefited from the experience, a dietician and a pharmacist attended the meeting to offer advice about how to manage diabetes symptoms, as well as to dispel myths about the disease. The feedback was tremendous, and patients are eager to remain engaged with the project, Holmes said. This project was funded through a Eugene Washington PCORI Engagement Award, No. 3335, from the Patient-Centered Outcomes Research Institute.